The wetting properties of surfaces have a substantial effect on their self-cleaning properties. The self-cleaning properties are manifested in the removal or transport of dirt particles using a continuous media, usually water. There are two major transport mechanisms which are shown below. On super-hydrophobic surfaces the dirt particles are removed by droplets when they roll off the surface. On super-hydrophilic surfaces a film flow develops as water wets the surface and dirt particles are transported away by this film flow. The wetting properties of a surface can be modified by the change of the surface morphology and/or the surface chemistry. Transport mechanisms of dirt particles on super-hydrophobic (a) and super-hydrophilic (b) surfaces, respectively. In the SESBE project a novel method based on advanced surface engineering of nanostructured oxide coatings has been developed. The method uses chemical modification of nanostructured oxides to functionalize cement materials. The chemical functionalization is achieved with a novel photo-fixation method, which promotes reaction of desired gas molecules with low-coordinated surface sites in the nanoporous oxide substrate. This method is particularly effective when photocatalytic oxides such as TiO2 is mixed in the cement, or top-coated onto the cement. 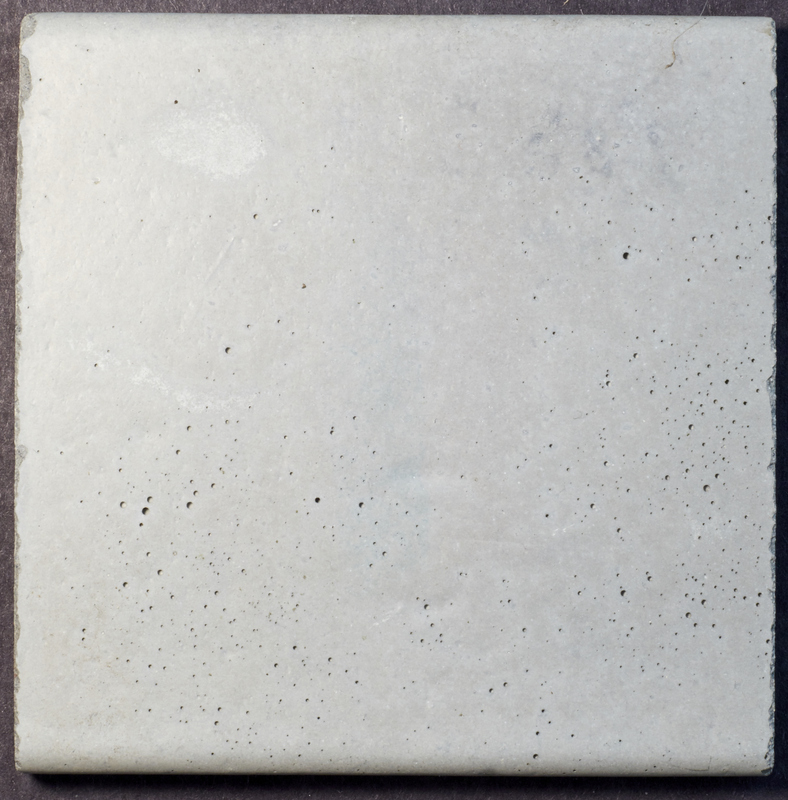 When the method is applied to the cement samples their surfaces become super-hydrophilic. 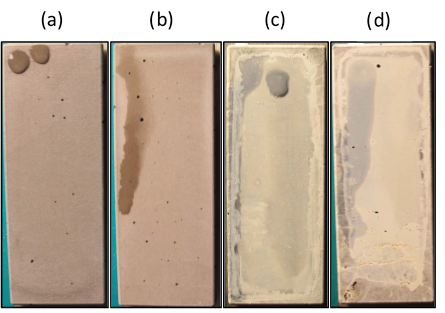 The Figure below shows results from rinsing tests applied on concrete samples with 0 wt% TiO2, surface functionalized concrete with 0 wt% TiO2, top-coated with TiO2 and top-coated with TiO2 and surface functionalized, respectively. It shows clearly that water slides off the samples (b) and (d) that are surface functionalized, implying that the functionalization changes the surface chemistry and favors for a hydrophilic surface, regardless TiO2 content. Top view image from sessile drop contact angle measurements on concrete samples (a) with 0 wt% TiO2, (b) surface functionalized concrete with 0 wt% TiO2, (c) top-coated with TiO2 and (d) top-coated with TiO2 and surface functionalized. The tilting angle of the samples was 45° and the volume of the applied droplet was 20 μl. Most of the water slides off the samples that are surface functionalized. Besides a super hydrophillic behavior, the coating shows also oleophobic properties. Long time exposure tests showed a very good anti graffiti performance of the new coating. 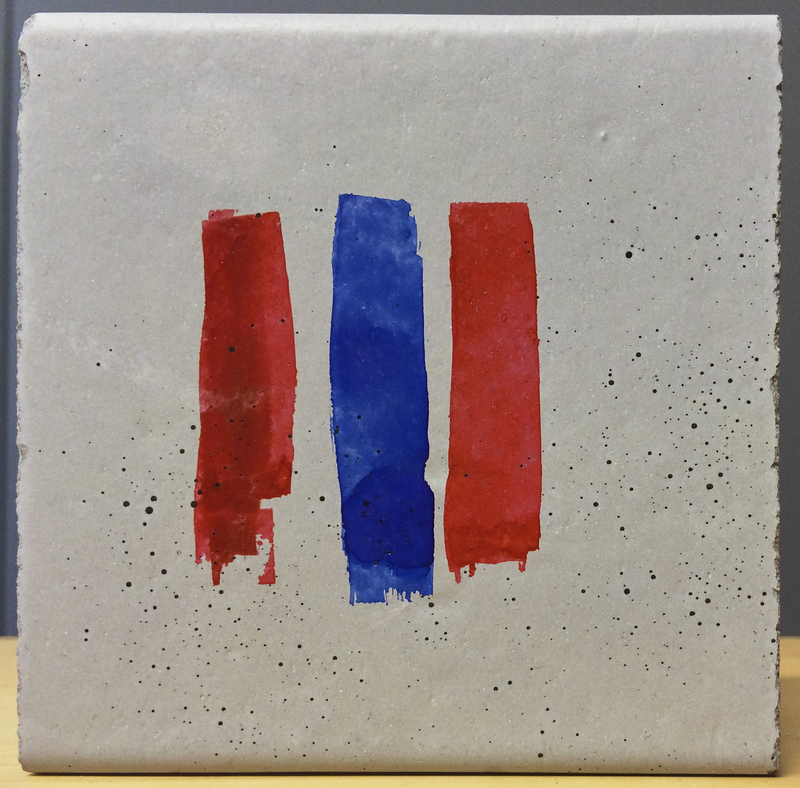 The Figures below show a RPC tile made with Sesbonite®, which was treated with the new functionalized coating and colored with a felt tip marker. Felt tip markers are usually used by tagger in the graffiti scene and are one of the most difficult paint materials to remove. After 8 month of outdoor exposure the marker were almost gone except for some traces. 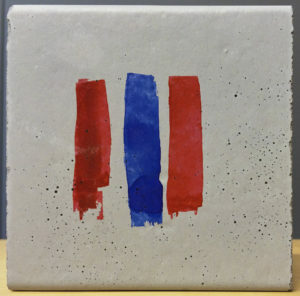 A RPC tile coated with the new agent and colored by felt tip markers. The same RPC tile after 8 month of outdoor exposure.